The Canada goose is one of the most recognizable birds in North America, and the V formation formed by a flock in flight is an iconic sight.. The goose's black neck and head contrasts against a white cheek and chinstrap patch. It has a brown back and wings, with a tan or light brown chest. Its tail is black at the edge, with a white U-shaped rump band that is especially visible when wings are spread. The lightness or darkness of the breast colour varies between subspecies. There are four subspecies currently recognized in BC: B.c. moffitti, B.c. parvipes, B.c. fulva, and B.c. occidentalis. 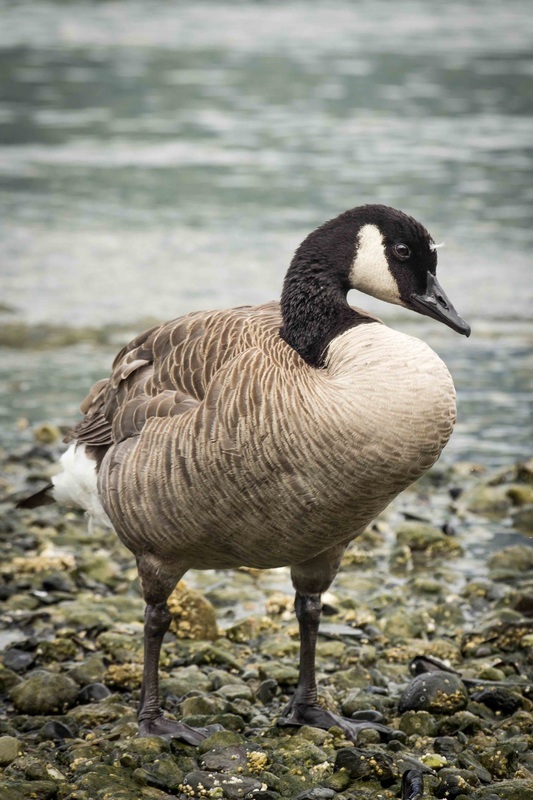 The online Sibley Guide has more information identifying the different Canada goose subspecies. The Canada goose is a large bird, with maximum length at over a meter long, with a wingspan of over 1.5 m.
Canada geese honk loudly, and make a variety of other hissing and barking noises. The Canada goose is found in and around freshwater habitats like lakes, ponds, river, and streams, both natural and man-made. This species tends to be very adapted to humans: it is often found around open areas like parks, meadows, and farms. It can be found on the BC coast throughout the year. It may be present year-round in some southern parts of the western provinces and the Maritimes, but the rest of Canada and Alaska generally only see it during the summer breeding months. The year-round range extends south throughout most of the northern and central United States. Populations found in northern North America during summer spend winter in the southern United States and parts of Mexico. The cackling goose was classified as the smallest Canada goose subspecies up until 2004. It is now acknowledged to be a separate species altogether, though it looks very much like a Canada goose. It breeds in the northernmost reaches of North America, and winters in select areas of the United States, but could be found on the coast of BC during migration. It is smaller than any Canada goose subspecies and has a shorter neck and bill. Since variation occurs with both species, it may be hard to distinguish between the two with certainty. Brants and the blue snow goose morph can sometimes appear similar to a Canada goose at first glance, but the differences should be obvious upon closer inspection. Differences are explained in detail by the online Sibley Guide. The Canada goose was introduced to Britain as an ornamental species over 300 years ago, and is now the most common goose Britain. The species was also introduced in Ireland, Norway, Finland, and Sweden. Numbers have increased in urban and suburban areas in recent years in both the native and introduced ranges. The Canada goose now has a reputation as being a pest in some of these areas. It is so common in parks in London, England, that the species is front and centre in the Royal Parks bird guide, and some British chefs advocate hunting it for food in order to decrease numbers. The subspecies occidentalis is a red-listed species in BC. It appears to be found in coastal BC areas mostly during its migration between breeding grounds in Alaska, and its winter range in Washington and Oregon. It is one of the darker-breasted subspecies. In 1993 Canadian William Lishman led the migration of a flock of Canada geese in a small aircraft, inspiring the movie Fly Away Home and leading to long-lasting work on endangered species migration routes. Click here to see a small video clip of his film Flight With Birds, and click here to see the updated technique being used with barnacle geese near Edinburgh. B.C. Conservation Data Centre. (2013). Species Summary: Branta canadensis occidentalis. B.C. Ministry of Environment. Accessed 23/07/2013. Canada Goose. The Birds of North America Online (A. Poole, Ed.). Ithaca: Cornell Lab of Ornithology. Retrieved from the Birds of North America Online. Accessed 23/07/2013. Canada goose (Branta canadensis). ARKive.org. Accessed 23/07/2013. Dunn, J. L. and Alderfer, J. (Eds.). (1999). National Geographic Field Guide to the Birds of North America. (3rd Ed.). Washington, D.C.: National Geographic Society. Pp. 72-73.